Fellow seeker, high achiever, recovering perfectionist, welcome to EBH Equus Coaching. My personal journey with Koelle began in 2010, when I left a leadership position in higher education fundraising to build community in new ways. Today I serve not-for-profit leaders, corporate teams, and private individuals with a unique mix of training, retreat facilitation, executive and Equus Coaching. A hunter/jumper equestrian for life, I live and breathe horses every day, learning with off-the-track Thoroughbreds and my own clever jumper, Abe. 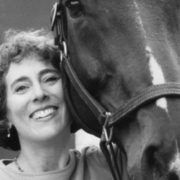 My essays appear in Equus magazine. Individuals, couples, families, work teams—all of us possess Basic Goodness and can find our peaceful power in relationships, work, and life. Come play with us at several gorgeous farms in Maryland and Virginia. Together, we’ll find and practice our truth. Welcome to the herd.